The information contained on this website should be used as a guide only. It does not constitute financial, legal or other advice and your use of the material on this web site does not give rise to any obligation on behalf of the Yield Finance Group or its related entities, or any author of any material on the web site. In this web site, any links or other references to other web sites, persons or information are produced solely for ease of reference. Accordingly, they should not be construed as an endorsement of those parties or their products and/or services. We do not warrant the quality, accuracy or suitability of any information contained in this or any other web site. 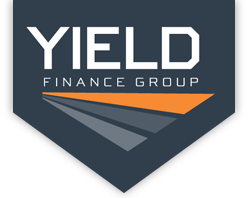 As far as is permitted by law, The Yield Finance Group excludes all liability to third parties arising directly or indirectly out of their use or reliance on materials contained in this website. Specifically, the Yield Finance Group does not warrant that the files contained in or referred to in this website are free of viruses or other defects. If that liability cannot, by law, be excluded, the liability of the Yield Finance Group will be limited to replacing the defective file. • you ensure that the works are clearly attributed to the Yield Finance Group.